Don’t want to spend loads of money to shape your directory website how you like it? No need to – we’ve got you covered. 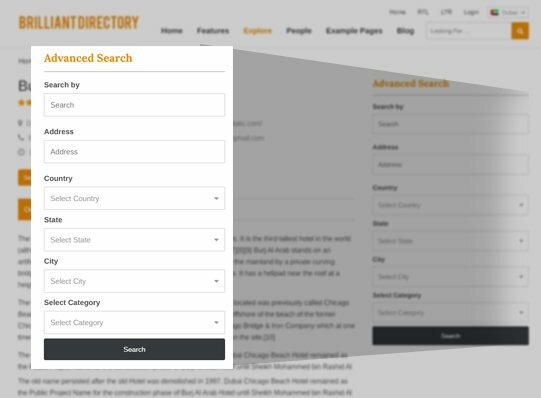 The easy to use but yet powerful Brilliant Directory theme software has plenty of amazing features and tweaks under the hood. 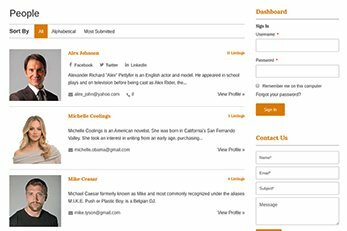 Building an online directory is made easy with many things you can customize. Starting from unlimited custom fields, categories, and listing submission packages, this theme can be customized and used for almost anything you can throw at it. Launch your online directory website today without having to worry about monthly charges. We don’t charge you anything to host the theme on your domain. Once installed, you’ re in full control. The admin dashboard lets control all aspects of your directory website. Do we charge commission on listing submissions? No, we don’t do that either – your profit is yours to keep. 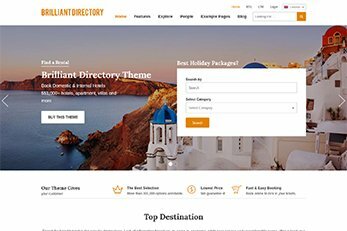 Use this theme to create anything from a hotels directory, city or restaurant or company guide to a local or international business directory. 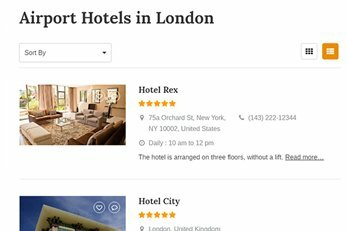 This directory theme is not just responsive and mobile friendly – it also comes with a mobile app view. 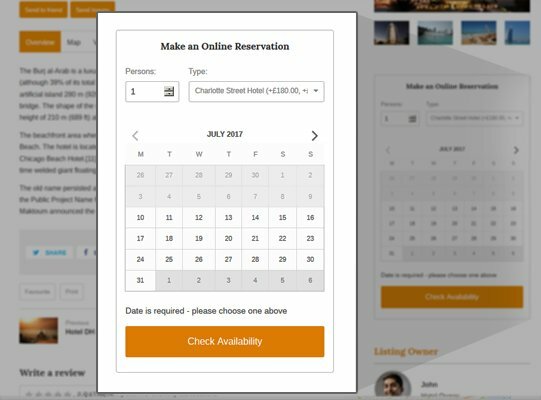 This feature is designed to show a minimized view which is optimized for mobiles if your users visit your directory website from a mobile. 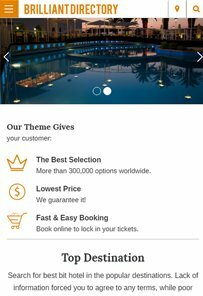 Thie app view has been designed for faster loading times and ease of navigation when your site is visited from mobile devices. Admin can activate or deactivate the mobile app view from theme settings. 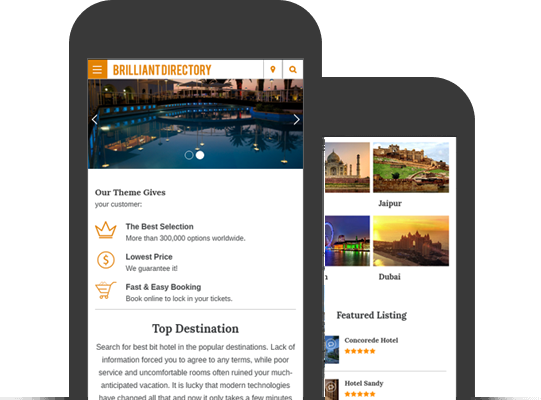 With the mobile app view switched off, your brilliant directory will still be responsive of course. 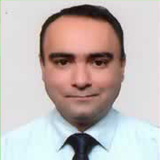 This is just an extra view for mobiles at your disposal in this software. The theme’s Advanced Search widget doesn’t only come with the fields you see on the demo. You can also create new fields from the dashboard and choose them from the widget’s options. This great feature makes it possible to use this theme for almost any type of directory you like. 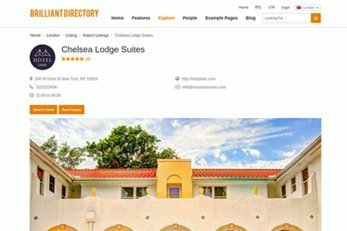 Imagine your directory website is for restaurants, businesses or even hotels. No matter what your directory is built for, the Advanced Search in this directory software can let your users refine their search by fileds which are relative to whatever your directory is for. You can also activate category-specific fields options on the search. This option will make it possible to display different fields according to the selected category. 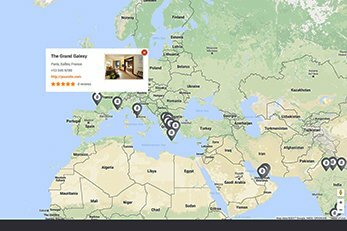 Building a site for different cities? 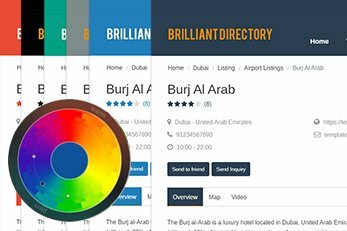 As all of our directory themes – Brilliant Directory also comes with our powerful Location Manager plugin. 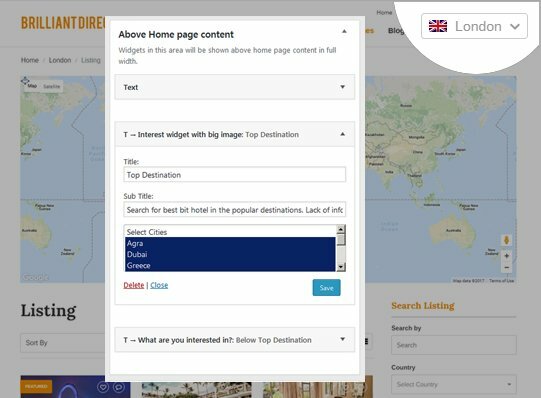 This powerful feature lets you create a directory site for more than 1 city and be able to manage your multi-city directory all from 1 admin dashboard. 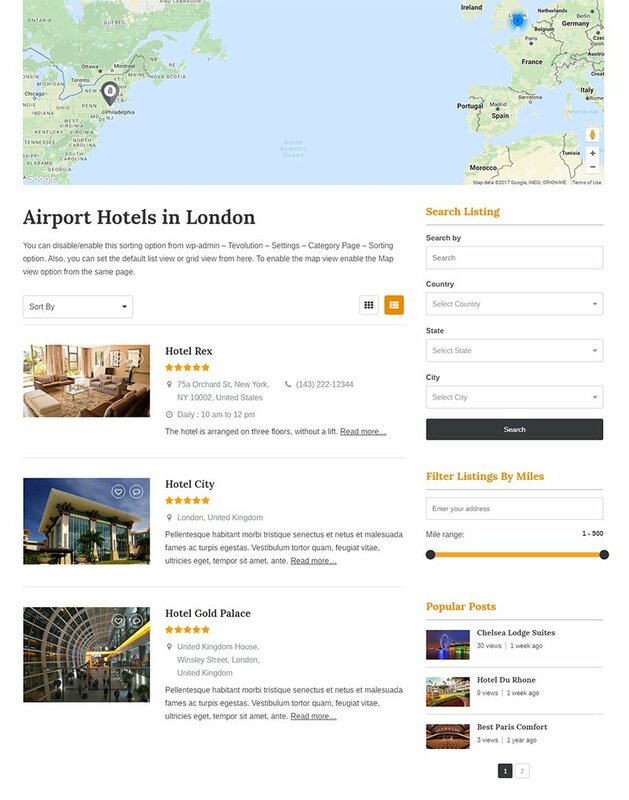 The theme can also be used without the Location Manager if it’s just 1 city your directory is targeting. 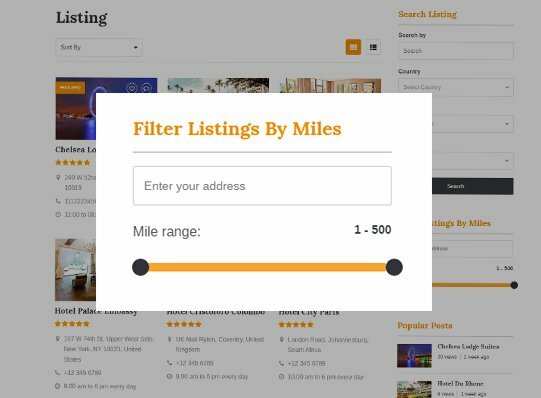 Let your users filter listings on category pages by mile/kilometer. This is just one of several widgets this directory theme comes loaded with to help you offer a great user experience to visitors on your site. The Homepage banner area in this directory software can be used in three ways. 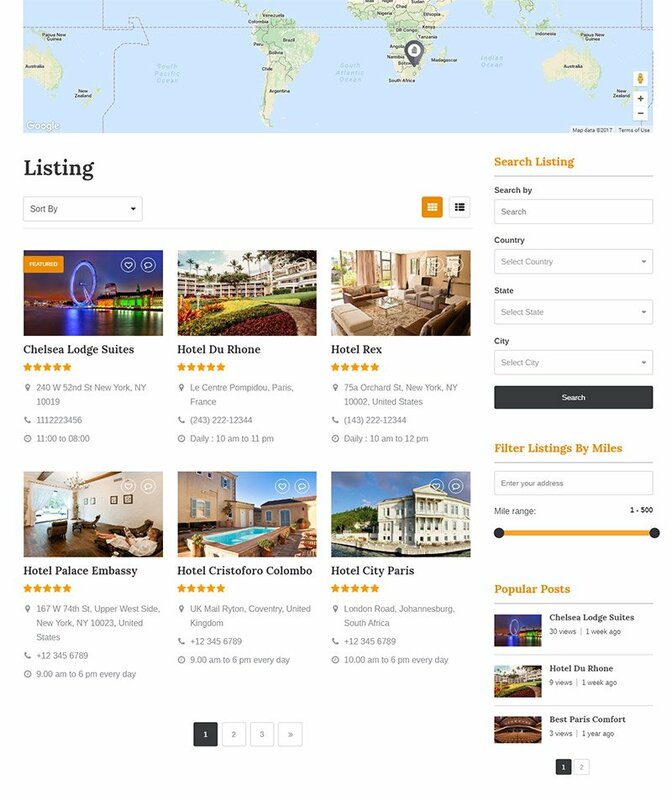 Whether you wish to use the theme’s beautiful image slider with custom images or the slider to show business listings with images, you can do it with a few simple mouse clicks. 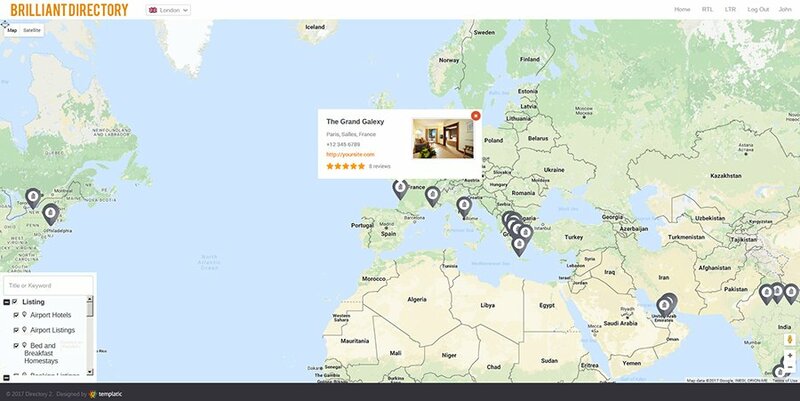 The homepage can also display the map with the pins for listings. These are all things you can achieve with widgets. 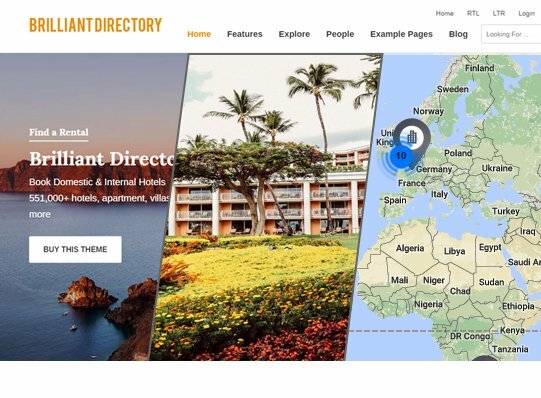 Can You Make Money With The Brilliant Directory Theme? 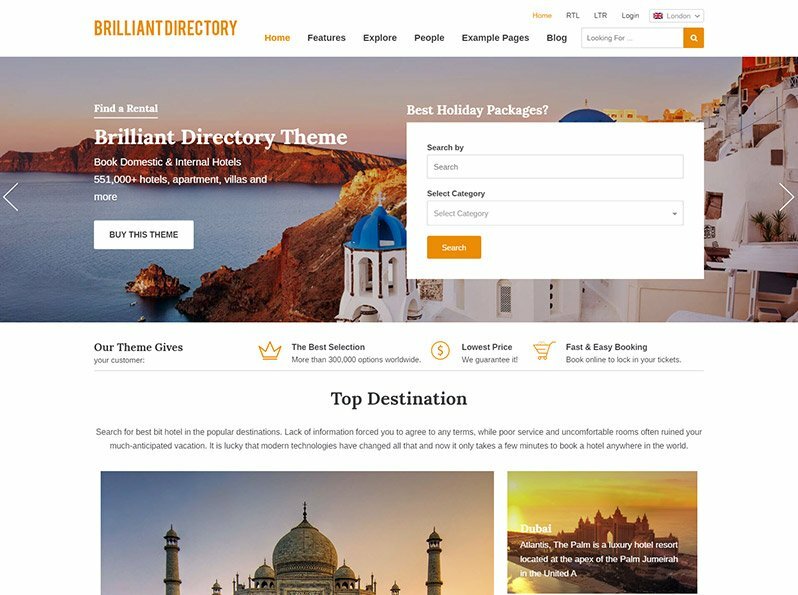 Brilliant Directory is an SEO friendly directory WordPress theme which is coded with focus on search engine optimization. Install the popular SEO plugins such as Yoast SEO, All In One SEO, Google XML Sitemaps and All In One Schema.org Rich Snippets to help you to optimize your directory website. 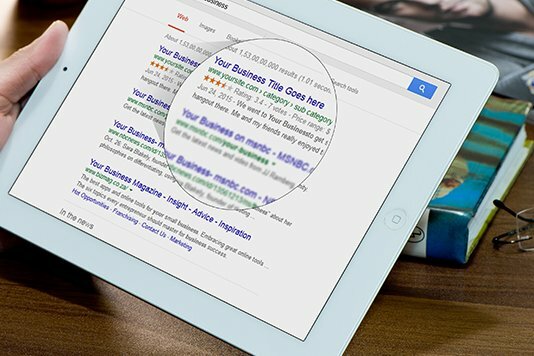 Offer your clients great online exposure for their business to ensure they keep coming back. 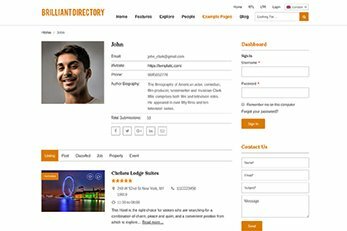 Our Directory software script is tested with WPML plugin. 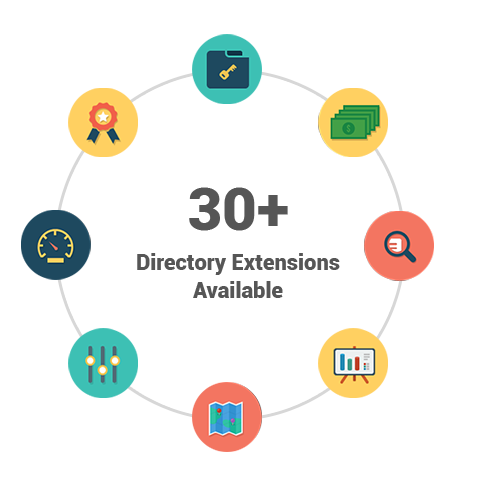 So you can create massive multilingual directory websites with this powerful directory script. You can also translate this theme into any other language instead of English. Translating Business Directory is possible with the provided .PO and .MO files, you don’t need the WPML plugin for that. This theme also supports RTL languages so you can build a business directory in Arabic or Hebrew if you like. Use this powerful plugin to manage the content of your Directory site with intuitive front-end WordPress editor. You can create beautiful looking web pages without changing a single line of code. Use the built-in skin builder to change design elements and the styling of your website. This awesome page builder lets you create complex layouts of your pages and posts with a simple drag-n-drop interface. Best of all, the visual composer lets you create new page content which is fully responsive too. 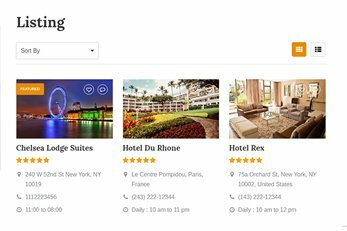 The Brilliant Directory theme is compatible with some of the most popular WordPress plugins. 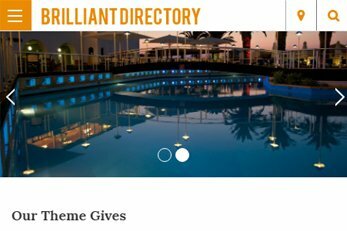 See below just some of the features that give our Directory Themes their brilliance. The PayPal payment gateway is included with this theme. 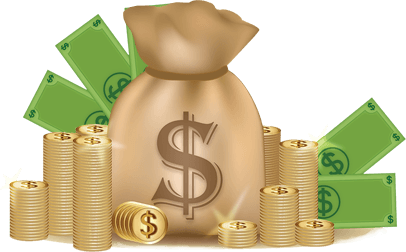 You also have several other paid payment gateway add-ons which are designed to work with this and all of our directory themes. These optional add-ons help you accept payments for listing submission with the payment processor that best suits your country or currency. Hundreds of hours of team effort went into design and development of this Business Directory theme. 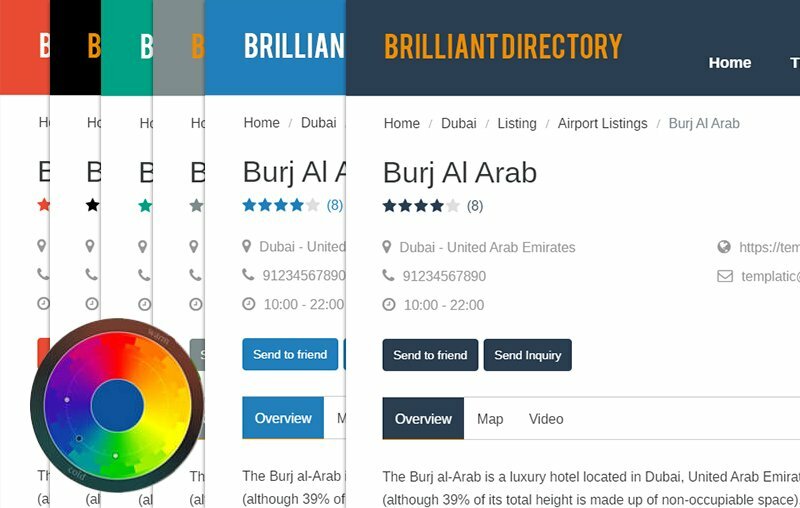 Get hold of this software at a fraction of the price which it actually cost to develop and start your online brilliant directory today.